The New England Chapter of Docomomo US, in collaboration with Public Archaeology Laboratory, Inc. (PAL), presents a walking tour of Roxbury, a neighborhood of Boston, Massachusetts and one of the first towns founded in the Massachusetts Bay Colony – subsequently annexed to Boston in 1868. Roxbury was dramatically transformed in the 1960s and 1970s with the designation of the Washington Park Urban Renewal Area, the Campus High School Urban Renewal Area, and the Kittredge Square Urban Renewal Area. Instituted under Edward Logue's directorship of the Boston Redevelopment Authority (BRA), the Washington Park renewal area was approved in 1963, two years following his appointment and six years following the creation of the BRA. Using government subsidies for slum clearance and low-income housing development as permitted under the 1937 Wagner-Steagall Housing Act, the Washington Park Urban Renewal Area was Boston's first residential urban renewal project and affected the center of Boston’s African-American community. The Campus High School renewal area was approved by the City in 1972; the Kittredge Square Urban Renewal Area in 1974. Our tour of Roxbury will demonstrate how a neighborhood in proximity to downtown Boston has transformed within the pressures of modern planning – and how the local community worked in concert with the BRA to shape their evolving neighborhood. We will meet at 9:30 AM on Saturday October 8, 2016 in front of the Bruce C. Bolling Municipal Building – the restored Ferdinand's Department Store – at 2300 Washington Street, Roxbury, MA 02119. During our morning walking tour we will visit civic structures and housing complexes within a half-mile walk of Dudley Square that coexist with the buildings of Victorian and early twentieth-century city. We will look at two structures by significant modern firms along this tour: Marcel Breuer's Madison Park High School and The Architects Collaborative's Boys and Girls Club of Boston. Also on our morning tour we will visit Marcus Garvey Gardens, a mid-rise housing complex by Roxbury-based architects Stull and Lee, and Madison Park’s Smith House and Haynes House, a high-rise and low-rise housing complex by John Sharratt and Samuel Glaser & Partners. Our morning tour will conclude at 1 PM with lunch in Dudley Square. Following lunch we will carpool and/or walk to Academy Homes I, a significant low-rise precast-built housing complex by Carl Koch & Associates, located approximately two miles southwest of Dudley Square. Our day will conclude at 3 PM. We encourage any participants who have additional time to also visit Carl Koch's precast-built Westminster Court, located one mile southeast of Academy Homes I. Our tour will be co-led by Docomomo US/New England board members Henry Moss of Bruner/Cott Architects and Planners; Marie S.A. Sorensen of Sorensen Partners | Architects + Planners; and Susan Ward, Textile, Fashion and Design History Curator and Consultant – and by Virginia H. Adams, Senior Architectural Historian at Public Archaeology Laboratory, Inc. PAL’s 2016 survey and interpretation of forty-five structures built in the Roxbury neighborhood between 1960 and 1980 serves as the backbone for our tour. The survey was commissioned by Urban Edge, a Roxbury-based community development corporation. The tour will be followed at 4 PM by a social gathering in Roxbury to which we invite tour participants and the many members of the Roxbury, Boston, and regional community who have an interest in the social and architectural history and evolution of Roxbury and who have contributed to the agenda and information underpinning this tour. Location to be announced. 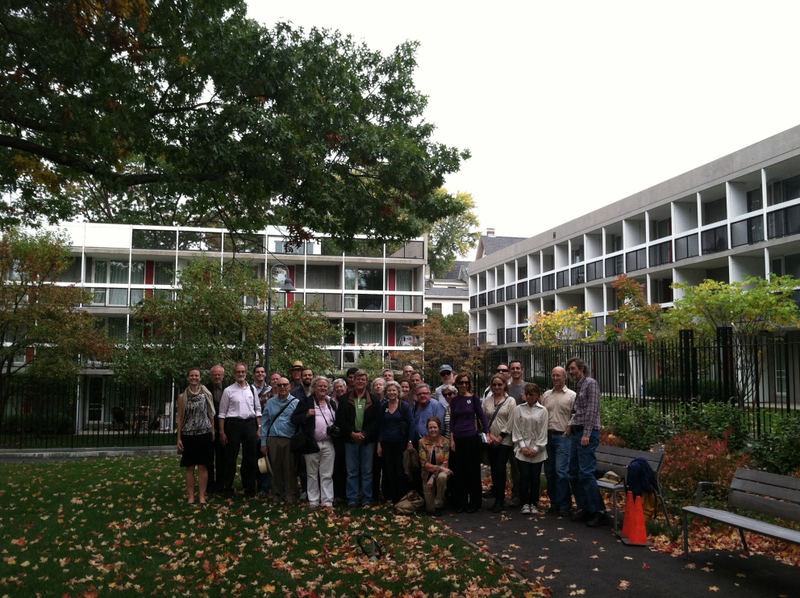 Members of the Docomomo US/New England Chapter, Tour Day 2012, at Josep Lluis Sert's Peabody Terrace, Cambridge, MA.